As the chart shows, inventory is mostly low – by historical standards (except for the 75 homes in the Walton District) there should be two to three times as many homes in each price range. The Lassiter High and Pope High School Districts have very low home inventory in the $700K- $999K ranges, with only 13 and 10 homes respectively. The interesting stat is the composition of the 75 homes in the Walton High District in the $300-$500K range – a big jump in supply over the last few months – there is not one new construction home in the group, and only 16 of the 75 homes are under $350K. 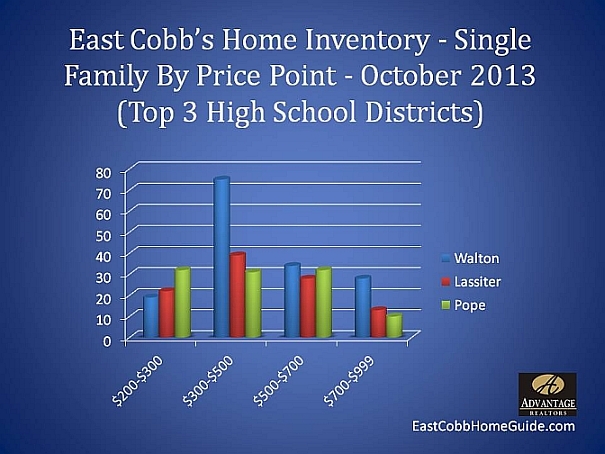 For more information about homes and markets in any East Cobb school district or neighborhood, contact Robert Whitfield: 678-585-9691. This entry was posted in Uncategorized and tagged East Cobb Real Estate Market, East Cobb Single Family Inventory, Marietta Homes October 2013 by admin. Bookmark the permalink.